These general precautions will help you feel and be safe. You will find the following tips helpful, especially at night, not only while attending classes but in your off-campus activities. Consider buying a backpack for carrying books. This allows your arms to be free. Wear comfortable clothing that allows you to move and shoes that allow you to easily run or kick. Be aware of alternate or escape routes and safe places. Consider enrolling in a self-defense course that covers emotional, verbal and physical self-defense. Be aware of your options and develop skills in using them. Do not expose expensive jewellery, money or the contents of your purse or bag. Plan your route and avoid shortcuts through dark, untravelled areas. Take the most direct, frequently travelled route. Walk with companions whenever possible and be aware of approaching strangers. Be cautious with personal information. Trust your instincts. If a situation feels threatening, leave and/or seek assistance. Familiarize yourself with the locations of Direct Dial phones. There are 15 Direct Dial phones around the campus. 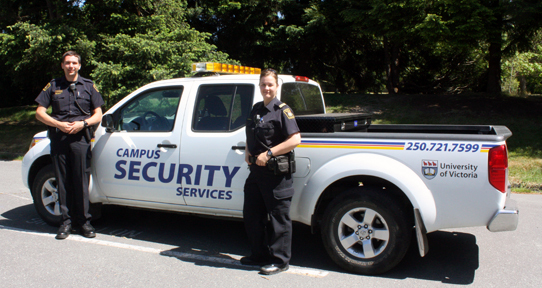 When working alone at night consider staying in contact with Security, using the Campus Alone program, when possible or other colleagues or friends. Park near a light standard if possible, as close to your building and/or the entrance to the lot. Try to park in the same lot and same location on the lot as classmates. Make sure your car is locked. Ensure the windows are closed. Make note of where you have parked. Make note of neighbouring buildings and businesses that you might take refuge in if necessary. Have your keys in hand so you do not have to linger before unlocking the door. Be observant as you approach your car. Check under the vehicle as you approach it. Check inside your vehicle before entering to make sure no one is hiding inside, even if the doors were locked. If you notice something unusual either around your car or in your car, continue walking to a safe place and call Security, where available, or the police. Utilize SafeWalk programmes where available. Get your instructor to arrange walking groups. Make sure you have some knowledge of the person you are walking with. Make sure others are aware of who you are walking with. Check the timetable for your route in advance of your bus trip. Keep a copy of the bus schedule for reference in case you must leave earlier or later. Plan to arrive at the bus stop only a few minutes before departure time. Be aware of your surroundings walking to and from the bus stop. Walk with confidence and purpose. If someone bothers you on the bus, tell the driver immediately. BC Transit has a Request Stop Service for any passenger between 9 p.m. and 5 a.m. Here's how the Request Stop Service works: Advise your driver about your "Request Stop" at least one stop ahead of the location where you want to get off the bus. Provide cross street references or landmarks if possible. There may be traffic hazards you are unaware of. The operator will determine whether the bus can safely stop at that location. Once the bus has come to a stop, exit via the front doors. Disembark carefully, looking both ways for bicycles that may pass the bus on the right-hand side. Passengers using wheelchairs must leave the bus at the accessible bus stops only, due to equipment requirements. Greater Victoria Regional Transit buses are equipped with radios and drivers can contact the Police and Campus Security Services in an emergency.